The Republican Party was created in the early 1850's by anti-slavery activists and individuals who believed that government should grant western lands to settlers free of charge. The first informal meeting of the party took place in Ripon, Wisconsin, a small town northwest of Milwaukee. The first official Republican meeting took place on July 6th, 1854 in Jackson, Michigan. The name "Republican" was chosen because it alluded to equality and reminded individuals of Thomas Jefferson's Democratic-Republican Party. At the Jackson convention, the new party adopted a platform and nominated candidates for office in Michigan. Presidents during most of the late nineteenth century and the early part of the twentieth century were Republicans. While the Democrats and Franklin Roosevelt tended to dominate American politics in the 1930's and 40's, for 28 of the forty years from 1952 through 1992, the White House was in Republican hands - under Presidents Eisenhower, Nixon, Ford, Reagan and Bush. Under the last two, Reagan and Bush, the United States became the world's only superpower, winning the Cold War from the old Soviet Union and releasing millions from Communist oppression. Most states ask voters when they register to express party preference. Voters don't have to do so, but registration lists let the parties know exactly which voters they want to be sure vote on Election Day. Just because voters register as a Republican, they don't need to vote that way - many voters split their tickets, voting for candidates in both parties. But the national party is made up of all registered Republicans in all 50 states. For the most part they are the voters in Republican Presidential primaries and caucuses. They are the heart and soul of the party. The symbol of the Republican Party is the elephant. During the mid term elections way back in 1874, Democrats tried to scare voters into thinking President Grant would seek to run for an unprecedented third term. Thomas Nast, a cartoonist for Harper's Weekly, depicted a Democratic jackass trying to scare a Republican elephant - and both symbols stuck. For a long time Republicans have been known as the "G.O.P." And party faithfuls thought it meant the "Grand Old Party." But apparently the original meaning (in 1875) was "gallant old party." And when automobiles were invented it also came to mean, "get out and push." That's still a pretty good slogan for Republicans who depend every campaign year on the hard work of hundreds of thousands of volunteers to get out and vote and push people to support the causes of the Republican Party. Abolishing slavery. Free speech. Women's suffrage. In today's stereotypes, none of these sounds like a typical Republican issue, yet they are stances the Republican Party, in opposition to the Democratic Party, adopted early on. Reducing the government. Streamlining the bureaucracy. Returning power to the states. These issues don't sound like they would be the promises of the party of Lincoln, the party that fought to preserve the national union, but they are, and logically so. With a core belief in the idea of the primacy of individuals, the Republican Party, since its inception, has been at the forefront of the fight for individuals' rights in opposition to a large, bloated government. The Republican Party has always thrived on challenges and difficult positions. Its present role as leader of the revolution in which the principles of government are being re-evaluated is a role it has traditionally embraced. At the time of its founding, the Republican Party was organized as an answer to the divided politics, political turmoil, arguments and internal division, particularly over slavery, that plagued the many existing political parties in the United States in 1854. The Free Soil Party, asserting that all men had a natural right to the soil, demanded that the government re-evaluate homesteading legislation and grant land to settlers free of charge. The Conscience Whigs, the "radical" faction of the Whig Party in the North, alienated themselves from their Southern counterparts by adopting an anti-slavery position. And the Kansas-Nebraska Act, which allowed territories to determine whether slavery would be legalized in accordance with "popular sovereignty" and thereby nullify the principles of the Missouri Compromise, created a schism within the Democratic Party. A staunch Anti-Nebraska Democrat, Alvan E. Bovay, like his fellow Americans, was disillusioned by this atmosphere of confusion and division. Taking advantage of the political turmoil caused by the Kansas-Nebraska Act, Bovay united discouraged members from the Free Soil Party, the Conscience Whigs and the Anti-Nebraska Democrats. Meeting in a Congregational church in Ripon, Wis., he helped establish a party that represented the interests of the North and the abolitionists by merging two fundamental issues: free land and preventing the spread of slavery into the Western territories. Realizing the new party needed a name to help unify it, Bovay decided on the term Republican because it was simple, synonymous with equality and alluded to the earlier party of Thomas Jefferson, the Democratic-Republicans. On July 6, 1854, in Jackson, Mich., the Republican Party formally organized itself by holding its first convention, adopting a platform and nominating a full slate of candidates for state offices. 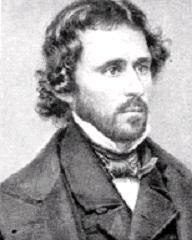 Other states soon followed, and the first Republican candidate for president, John C. Frémont, ran in 1856 with the slogan "Free soil, free labor, free speech, free men, Frémont." Even though he ran on a third-party ticket, Frémont managed to capture a third of the vote, and the Republican Party began to add members throughout the land. As tensions mounted over the slavery issue, more anti-slavery Republicans began to run for office and be elected, even with the risks involved with taking this stance. Republican Sen. Charles Sumner of Massachusetts experienced this danger firsthand. In May 1856, he delivered a passionate anti-slavery speech in which he made critical remarks about several pro-slavery senators, including Andrew F. Butler of South Carolina. Sumner infuriated Rep. Preston S. Brooks, the son of one of Butler's cousins, who felt his family honor had been insulted. Two days later, Brooks walked into the Senate and beat Sumner unconscious with a cane. This incident electrified the nation and helped to galvanize Northern opinion against the South; Southern opinion hailed Brooks as a hero. But Sumner stood by his principles, and after a three-year, painful convalescence, he returned to the Senate to continue his struggle against slavery. With the election of Abraham Lincoln in 1860, the Republicans firmly established themselves as a major party capable of holding onto the White House for 60 of the next 100 years. Faced with the first shots of the Civil War barely a month after his inauguration, preserving the Union was Lincoln's greatest challenge--and no doubt his greatest achievement. But it was by no means his only accomplishment. Amid the fierce and bloody battles of the Civil War, the Lincoln administration established the Department of Agriculture, the Bureau of Internal Revenue and a national banking system. Understanding the importance of settling the frontier, as well as having a piece of land to call your own, Lincoln passed the Homestead Act, which satisfied the former Free Soil members by offering public land grants. Hoping to encourage a higher level of education, Lincoln also donated land for agricultural and technical colleges to the states through the Land Grant College Act, which established universities throughout the United States. Fully sensitive to the symbolism of their name, the Republicans worked to deal the death blow to slavery with Lincoln's Emancipation Proclamation and the passage, by a Republican Congress, of the 13th Amendment, which outlawed slavery. Hoping to permanently turn back the Democratic advance in the South, immediately after the Civil War the Republican Congress continued to push through legislation to extend the full protection of civil rights to blacks. During Reconstruction, the mostly Democratic South, which had seceded from both the Union and Congress, struggled to regain its footing. Meanwhile, the Republicans took advantage of their majority and passed several measures to improve the quality of life for blacks throughout the entire Union. First the Republicans passed a Civil Rights Act in 1866 recognizing blacks as U.S. citizens. This act hoped to weaken the South by denying states the power to restrict blacks from testifying in a court of law or from owning their own property. Continuing to take advantage of their majority, Republicans proposed the 14th Amendment, which became part of the Constitution in 1868, stating: "All persons born or naturalized in the United States, and subject to the jurisdiction thereof, are citizens of the United States and of the state wherein they reside. No state shall make or enforce any law which shall abridge the privileges or immunities of citizens of the United States; nor shall any state deprive any person of life, liberty, or property, without due process of law; nor deny to any person within its jurisdiction the equal protection of the laws." That same year the Republican Congress also passed the National Eight Hour Law, which, though it applied only to government workers, brought relief for overworked federal employees by limiting the work day to eight hours. Assuming the presidency when McKinley was assassinated in 1901, President Theodore Roosevelt busied himself with what he considered to be the most pressing issue, ensuring the Republican principle of competition in a free market. To do so, Roosevelt used the Sherman Anti-Trust Act, passed in 1890 under Republican President Benjamin Harrison, to successfully prosecute and break up several large business monopolies. In 1903, Roosevelt became involved with foreign policy, supporting revolutionaries who then formed the Republic of Panama. His actions in Panama resulted in the treaty that permitted construction of the Panama Canal. In 1905, Roosevelt--who popularized the West African phrase "Speak softly and carry a big stick" to explain his view on foreign policy--successfully negotiated the Treaty of Portsmouth, ending the conflict between Russia and Japan. Roosevelt's accomplishments as a peacemaker earned him the Nobel Peace Prize and the distinction of being the first American to receive this award. Roosevelt easily won a second term and proceeded to continue to stand by his principles. Roosevelt, who was constantly bucking public prejudice, appointed the Cabinet's first Jewish member, Oscar Strauss. Then, in 1906, after reading Upton Sinclair's The Jungle, Roosevelt instructed Congress to pass laws concerning meat inspection and pure food and drug legislation. Two years later he placed 150 million acres of forest land into federal reserves and organized a National Conservation Conference. Believing in the importance of work, Roosevelt was also responsible for creating the Department of Labor. Although his immense popularity almost guaranteed that he could be elected to a third term, following precedent, Roosevelt retired, allowing William Taft to become the next Republican to hold the presidential office. 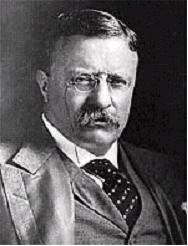 Discord struck the Republican Party in the 1912 election as Teddy Roosevelt, dissatisfied with President Taft, led his supporters on the "Bull Moose" ticket against the president. Playing to the advantage of a split Republican vote, as they would again 80 years later, the Democrats won the election with Woodrow Wilson. When Wilson ran for re-election in 1916, he promised to keep the United States out of World War I. Yet shortly after his re-election, the United States stepped onto the European battleground and entered the war. By mid-1918 the Republican Party won control of Congress as Wilson's popularity began to wane because World War I dragged on. Some people have argued that Republicans fought to give blacks equal rights and then the vote as a way of wresting control of the South away from the Democrats. While it is true that almost all blacks voted Republican, these were very dangerous and controversial issues at the time. For whatever reason, many Republican politicians risked their careers on that period's "third rail" of politics and managed to not only abolish slavery, but eventually even established a black's right to vote as well. In fact, many blacks even held elected office and were influential in state legislatures. And, in 1869, the first blacks entered Congress as members of the Republican Party, establishing a trend that was not broken until 1935 when the first black Democrat finally was elected to Congress. Meanwhile, Republicans continued being elected to the White House. In 1868, Civil War hero Ulysses S. Grant won the presidency easily and was re-elected in 1872. Although he seemed a bit bewildered by the transition from the military life of a general to being president, under Grant the Republican commitment to sound money policies continued, and the Department of Justice and the Weather Bureau were established. The Republicans in Congress continued to boldly set the agenda, and in 1870 they proposed and passed the 15th Amendment, which guaranteed voting rights regardless of race, creed or previous condition of servitude. Setting another precedent two years later, the Republican Congress turned its sights toward women's issues and authorized equal pay for equal work performed by women employed by federal agencies. Not surprisingly, the Republican appeal held in 1880 when the party won its sixth consecutive presidential election with the election of the Civil War hero James A. Garfield and also managed to regain small majorities in both the House and the Senate. Following Garfield's assassination, Chester A. Arthur succeeded to the Oval Office and, in 1883, oversaw the passage of the Pendleton Act through Congress. This bill classified about 10 percent of all government jobs and created a bipartisan Civil Service Commission to prepare and administer competitive examinations for these positions. As dreary as this bill sounds, it was important because it made at least part of the government bureaucracy a professional work force. Suddenly the Republicans' fortunes changed, and embarking on a decade-long period of quick reversals, the Republicans lost the 1884 election. But by this time the party had firmly established itself as a permanent force in American politics by not only preserving the Union and leading the nation through the Reconstruction, but by also striking a chord of greater personal autonomy within the national psyche. Yet while the presidency was regained for one term with the 1888 election of Benjamin Harrison, with the re-emergence of the South from the destruction of the Civil War the Republicans were shut out for the first time since the Civil War in the election of 1892, as the Democrats won control of the House, the Senate and the presidency. Standing in sharp contrast to the two existing political parties' present stereotypes regarding minorities and women, once again the Republican Party was the vanguard in relation to women. In 1917, Jeannette Rankin, a Montana Republican, became the first woman to serve in the House. Committed to her pacifist beliefs, she was the only member of Congress to vote against entry into both World War I and World War II. Shortly after Ms. Rankin's election to Congress, the 19th Amendment was passed in 1919. The amendment's journey to ratification had been a long and difficult one. Starting in 1896, the Republican Party became the first major party to officially favor women's suffrage. That year, Republican Sen. A. A. Sargent of California introduced a proposal in the Senate to give women the right to vote. The proposal was defeated four times in the Democratic-controlled Senate. When the Republican Party regained control of Congress, the Equal Suffrage Amendment finally passed (304-88). Only 16 Republicans opposed the amendment. When the amendment was submitted to the states, 26 of the 36 states that ratified it had Republican-controlled legislatures. Of the nine states that voted against ratification, eight were controlled by Democrats. Twelve states, all Republican, had given women full suffrage before the federal amendment was finally ratified.